王伟, 王敏芳, 刘坤, 魏克涛, 柯于富. 鄂东南铁山铁铜矿床成矿流体特征及铁的迁移与沉淀富集机制[J]. 地质通报, 2018, 37(6): 1125-1141. 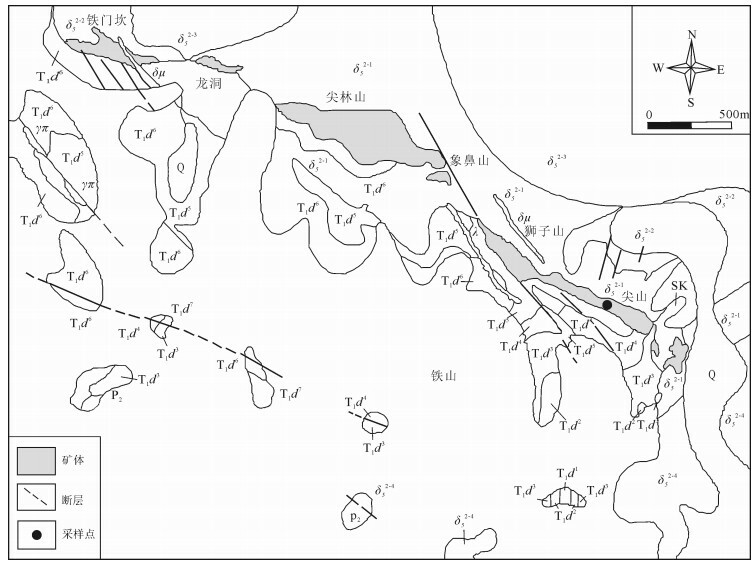 Wang W, Wang M F, Liu K, Wei K T, Ke Y F. Thermodynamic conditions of ore-forming fluid and migration and enrich-ment mechanism of iron in the Tieshan Fe-Cu deposit, southeastern Hubei Province[J]. Geological Bulletin of China, 2018, 37(6): 1125-1141. Abstract: Based on petrographic observations of garnet and tremolite collected from the Tieshan Fe-Cu deposit, the authors found that the primary fluid inclusions are generally of three types:gaseous inclusions, liquid inclusions and halite daughter mineral-bearing three-phase inclusion. 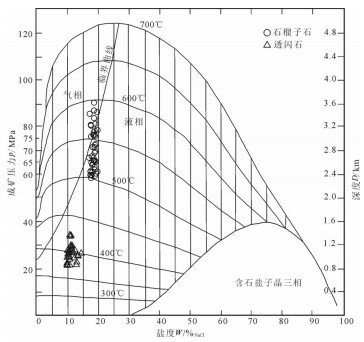 According to temperature measurement results, the homogenization temperatures at the prograde skarn stage range from 499.2℃ to 594.8℃, the fluid salinity peak values range from 17.3%NaCl to 19.5%NaCl, the densities range from 0.45g/cm3 to 0.62g/cm3, and the pressure ranges from 58.0×106 Pa to 90.6×106 Pa; the homogenization temperatures at the retrograde alteration stage range from 356.2℃ to 428.6℃, the fluid salinity peak values range from 7.2% Nacl to 15.5%NaCl, the densities range from 0.52g/cm 3 to 0.83g/cm3, the metallogenic pressure ranges from 23.8×106 Pa to 29.7×106 Pa, and the metallogenic depth ranges from 0.90km to 1.12km with an average of 0.95km. 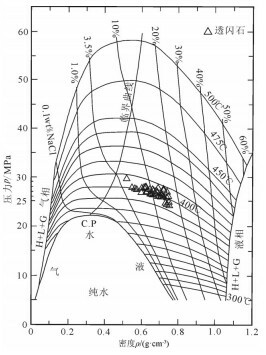 These data indicate that the ore-forming fluid of the Tieshan Fe-Cu deposit has the characteristics of high temperature, moderate-low salinity, and low density. Therefore, the Tieshan Fe-Cu deposit is an epithermal skarn deposit. Composition analysis of grouped fluid inclusions indicates that gaseous composition is dominated by H2O and CO2, fol-lowed by small amounts of CH4, C2H6, N2 and H2S, the cations of liquid composition are dominated by Na+, Ca2+ and K+, and the an-ions are dominated by SO42- and Cl-. The results show that Cl-, SO42- and carbonate complexes played an important role in migration and enrichment of iron. The mixing of fluids of different origins and the evolution of pH might have been the dominant enrichment and precipitation mechanism of the Tieshan Fe-Cu deposit. 王敏芳, 邓晓东, 毕诗健. 丰山斑岩型铜(钼)矿床中铂、钯的富集特征研究[J]. 地质与勘探, 2009, 45(2): 38–43. Wang M F, Deng X D, Bi S J, et al. Palladium, Platinum and Gold Concentrations in Fengshan Porphyry Cu-Mo Deposit, Hubei Province, China[J]. Acta Geoogica Sinica, 2009, 83(5): 893–901. DOI:10.1111/j.1755-6724.2009.00117.x. Wang M F, Gutzmer J, Michalak P P, et al. PGE geochemistry of the Fengshan Porphyry-skarn Cu-Mo deposit, Hubei Province, Eastern China[J]. Ore Geology Reviews, 2014, 56: 1–12. DOI:10.1016/j.oregeorev.2013.07.006. 周涛发, 范裕, 袁峰, 等. 长江中下游成矿带地质与矿产研究进展[J]. 岩石学报, 2012, 28(10): 3051–3066. 赵新福, 李建威, 马昌前. 鄂东南铁铜矿集区铜山口铜(钼)矿床40Ar/39Ar年代学及对区域成矿作用的指示[J]. 地质学报, 2006, 80(6): 849–862. 杨峰华. 湖北大冶铁山矿床钠化蚀变与成矿关系的探讨[J]. 地质与勘探, 2001, 37(6): 20–24. 谢桂青, 毛景文, 李瑞玲, 等. 鄂东南地区Cu-Au-Mo-(W)矿床的成矿时代及其成矿地球动力学背景探讨:辉钼矿Re-Os同位素年龄[J]. 矿床地质, 2006, 25(1): 43–52. 丁丽雪, 黄圭成, 夏金龙, 等. 鄂东南地区姜桥花岗闪长岩锆石UPb年龄、Hf同位素特征及其地质意义[J]. 岩石矿物学杂志, 2013, 32(3): 275–290. 谢桂青, 李瑞玲, 蒋国豪, 等. 鄂东南地区晚中生代侵入岩的地球化学和成因及对岩石圈减薄时限的制约[J]. 岩石学报, 2008, 24(8): 1703–1714. 谢桂青, 朱乔乔, 姚磊, 等. 鄂东南地区晚中生代铜铁金多金属矿的区域成矿模型探讨[J]. 矿物岩石地球化学通报, 2013, 32(4): 418–426. 瞿泓滢, 王浩琳, 裴荣富, 等. 鄂东南地区与铁山和金山店铁矿有关的花岗质岩体锆石LA-ICP-MS年龄和Hf同位素组成及其地质意义[J]. 岩石学报, 2012, 28(1): 147–165. 瞿泓滢, 裴荣富, 姚磊, 等. 湖北大冶与矽卡岩型铁矿床有关的铁山岩体中黑云母、角闪石40Ar-39Ar同位素年龄及其地质意义[J]. 中国地质, 2012, 39(6): 1635–1646. 薛清泼, 徐九华, 陈伟, 等. 大冶铁矿尖林山-狮子山矿段接触带形态及控矿规律分析[J]. 有色金属(矿山部分), 2006, 58(5): 14–16. 石准立, 熊鹏飞, 王定域, 等. 湖北铁山"大冶式"铁矿床的某些成因问题[J]. 地质科技情报, 1983(S1): 10–29. Li J W, Vasconcelos P M, Zhou M F, et al. Longevity of magmatic-hydrothermal systems in the Daye Cu-Fe-Au District, eastern China with implications for mineral exploration[J]. Ore Geology Reviews, 2014, 57: 375–392. DOI:10.1016/j.oregeorev.2013.08.002. 何鹏, 严光生, 祝新友, 等. 青海赛什塘铜矿床流体包裹体研究[J]. 中国地质, 2013, 40(2): 580–593. 黄诚, 李晓峰, 王立发, 等. 湖南黄沙坪多金属矿床流体包裹体研究[J]. 岩石学报, 2013, 29(12): 4232–4244. 张承帅, 毛景文, 张长青, 等. 福建马坑矽卡岩型铁(钼)矿床流体包裹体特征及成矿机制研究[J]. 矿床地质, 2013, 32(2): 289–307. 倪培, 范宏瑞, 丁俊英. 流体包裹体研究进展[J]. 矿物岩石地球化学通报, 2014, 33(1): 1–5. 孙贺, 肖益林. 流体包裹体研究:进展、地质应用及展望[J]. 地球科学进展, 2009, 24(10): 1105–1121. DOI:10.3321/j.issn:1001-8166.2009.10.005. 武广, 陈毓川, 李宗彦, 等. 豫西银家沟硫铁多金属矿床流体包裹体和同位素特征[J]. 地质学报, 2013, 87(3): 353–374. 杨永飞, 李诺, 王莉娟. 河南省东沟超大型钼矿床流体包裹体研究[J]. 岩石学报, 2011(5): 1453–1466. 范宏瑞, 陶克捷, 谢奕汉, 等. 白云鄂博REE-Fe-Nb矿床稀土氟碳酸盐矿物激光拉曼光谱特征及流体包裹体内稀土子矿物的鉴定[J]. 岩石学报, 2003, 19(1): 169–172. 黄凡, 刘翠辉, 谢有炜, 等. 内蒙古宜里钼矿流体包裹体特征及其地质意义[J]. 地质与勘探, 2014, 50(3): 445–453. 杨丹, 徐文艺. 激光拉曼光谱测定流体包裹体成分研究进展[J]. 光谱学与光谱分析, 2014, 34(4): 874–878. 刘敏, 王志良, 张作衡, 等. 新疆东天山土屋斑岩铜矿床流体包裹体地球化学特征[J]. 岩石学报, 2009, 25(6): 1446–1455. 杨丹, 徐文艺. 多种矿物流体包裹体中液相阴阳离子的同时测定[J]. 岩石矿物学杂志, 2014, 33(3): 591–596. 杨志明, 谢玉玲, 李光明, 等. 西藏冈底斯斑岩铜矿带厅宫铜矿床流体包裹体研究[J]. 矿床地质, 2005, 24(6): 584–594. 李晓春, 范宏瑞, 胡芳芳, 等. 单个流体包裹体LA-ICP-MS成分分析及在矿床学中的应用[J]. 矿床地质, 2010, 29(6): 1017–1028. Ulrich T, Günther D, Heinrich C A. 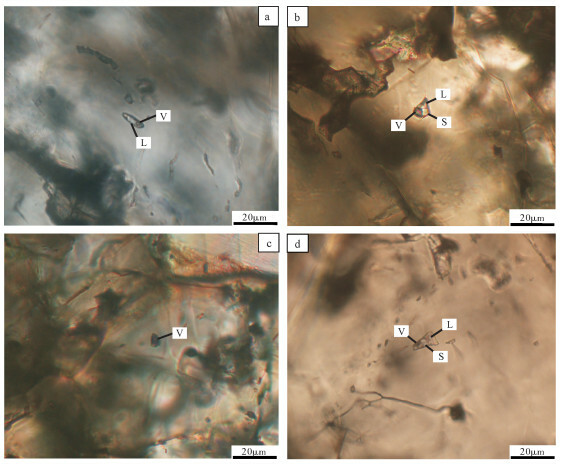 The evolution of a porphyry Cu-Au deposit, based on LA-ICP-MS analysis of fluid inclusions:Bajo de la Alumbrera, Argentina[J]. 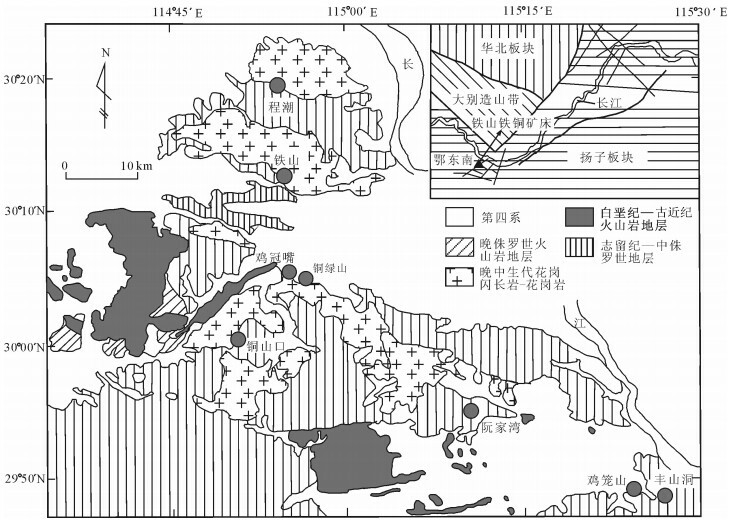 Economic Geology, 2001, 96(8): 1743–1774. DOI:10.2113/gsecongeo.96.8.1743. Rusk B G, Reed M H, Dilles J H, et al. Compositions of magmatic hydrothermal fluids determined by LA-ICP-MS of fluid inclusions from the porphyry copper-molybdenum deposit at Butte, MT[J]. Chemical Geology, 2004, 210(1): 173–199. 陈雷, 秦克章, 李光明, 等. 西藏山南努日铜钼钨矿床矽卡岩地球化学特征及成因[J]. 地质与勘探, 2011, 47(1): 78–88. 姚鹏, 顾雪祥, 李金高, 等. 甲马铜多金属矿床层控矽卡岩流体包裹体特征及其成因意义[J]. 成都理工大学学报(自然科学版), 2006, 33(3): 285–293. 张勇, 孙景贵, 陈冬, 等. 延边地区天宝山多金属矿田的流体特征与成矿模式[J]. 吉林大学学报(地球科学版), 2012, 42(6): 1665–1675. 赵斌, 赵劲松, 张重泽, 等. 大冶-九江地区Fe, Cu(Au)和Au(Cu)矿床夕卡岩矿物里的熔融包裹体特征[J]. 中国科学(D辑:地球科学), 2002, 32(7): 550–561. 赵劲松, 夏斌, 丘学林, 等. 海南岛石碌矽卡岩铁矿石中石榴子石的熔融包裹体及其意义[J]. 岩石学报, 2008, 24(1): 149–160. 赵劲松, 赵斌, 李建威, 等. 矽卡岩岩浆对中国北方某些矽卡岩型矿床形成的制约——来自包裹体激光拉曼分析证据[J]. 岩石学报, 2015, 31(4): 1079–1088. 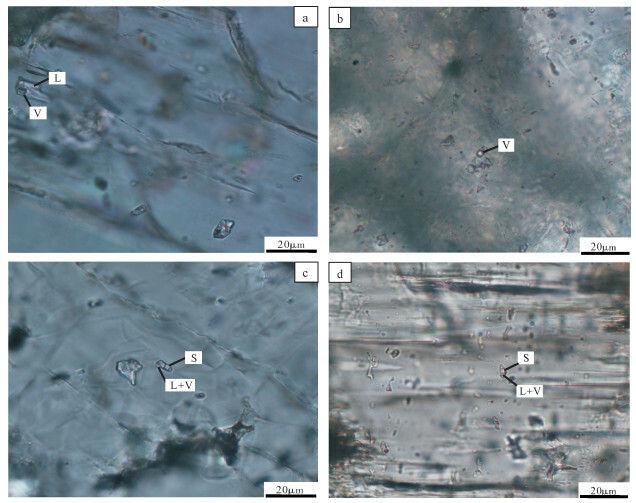 Kwak T A P. Fluid inclusions in skarns (carbonate replacement deposits)[J]. Journal of Metamorphic Geology, 1986, 4(4): 363–384. DOI:10.1111/jmg.1986.4.issue-4. Meinert L D, Dipple G M, Nicolescu S. World skarn deposits[M]. Economic Geology 100th Anniversary Volume: 2005: 299-336. 曹晓峰, 吕新彪, 何谋春, 等. 共生黑钨矿与石英中流体包裹体红外显微对比研究——以瑶岗仙石英脉型钨矿床为例[J]. 矿床地质, 2009, 28(5): 611–620. 王旭东, 倪培, 袁顺达, 等. 赣南漂塘钨矿锡石及共生石英中流体包裹体研究[J]. 地质学报, 2013, 87(6): 850–859. Xu Y, Jiang S, Zhu Z, et al. 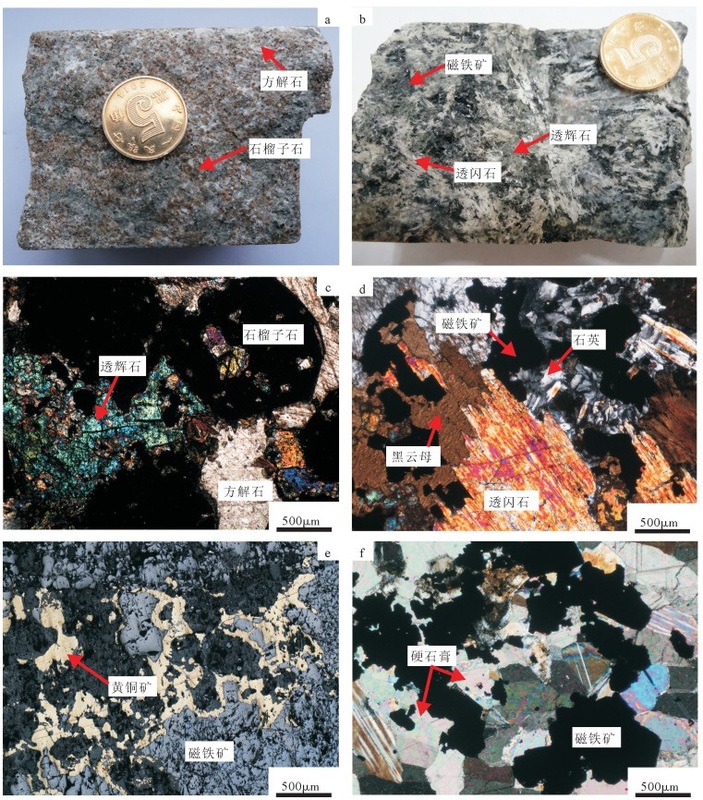 Mineral chemistry and H-O-S-Pb isotopic compositions of skarn type copper deposits in the Jiurui district of the Middle-Lower Yangtze River metallogenic belt, Eastern China[J]. Ore Geology Reviews, 2015, 69: 88–103. DOI:10.1016/j.oregeorev.2015.01.017. 张国胜. 鄂东南地区构造特征及其控岩控矿规律[J]. 湖北地矿, 1998, 12(2): 16–23. 王伟, 王敏芳, 郭晓南, 等. 鄂东南矿集区铁山铁矿床中磁铁矿元素地球化学特征及其地质意义[J]. 地质与勘探, 2015, 51(3): 451–465. 刘永耀, 孙振华, 杨少铭. 鄂东南过渡类型的寒武纪、奥陶纪地层[J]. 地层学杂志, 1984, 8(2): 94–106. 谢桂青, 赵海杰, 赵财胜, 等. 鄂东南铜绿山矿田矽卡岩型铜铁金矿床的辉钼矿Re-Os同位素年龄及其地质意义[J]. 矿床地质, 2009, 28(3): 227–239. 钱晶. 铁山铁(铜)矿床地质特征及成矿作用探讨[J]. 中国矿山工程, 2013, 42(4): 4–8. 朱和平, 王莉娟. 四极质谱测定流体包裹体中的气相成分[J]. 中国科学(D辑:地球科学), 2001, 31(7): 586–590. Hall D L, Stemer S M, Bodnar R J. Freezing point depression of NaCl-KCl-H2O solutions[J]. Economic Geology, 1988, 83: 197–202. DOI:10.2113/gsecongeo.83.1.197. 刘斌, 沈昆. 流体包裹体热力学[M]. 北京: 地质出版社, 1999: 84-90. 杨丹, 徐文艺, 崔艳合, 等. 二维气相色谱法测定流体包裹体中气相成分[J]. 岩矿测试, 2007, 26(6): 451–454. 张宝琛, 覃功炯, 王凤阁. 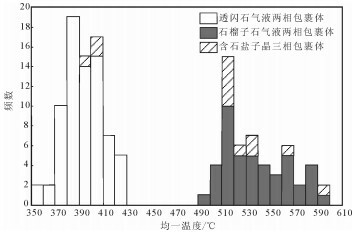 辽宁省岫岩县东堡子金矿流体包裹体研究[J]. 现代地质, 2002, 16(1): 26–30. 梅微, 吕新彪, 唐然坤, 等. 大兴安岭南段西坡拜仁达坝-维拉斯托矿床成矿流体特征及其演化[J]. 地球科学(中国地质大学学报), 2015, 40(1): 145–162. 张招崇, 侯通, 李厚民, 等. 岩浆-热液系统中铁的富集机制探讨[J]. 岩石学报, 2014, 30(5): 1189–1204. 杨小男, 徐兆文, 高庚, 等. 安徽铜陵朝山金矿床流体包裹体研究[J]. 岩石学报, 2008, 24(8): 1889–1899. 邵洁涟, 梅建明. 浙江火山岩区金矿床的矿物包裹体标型特征研究及其成因与找矿意义[J]. 矿物岩石, 1986, 6(3): 103–111. Bischoff J L. Densities of liquids and vapors in boiling NaCl-H2O solutions:A PVTX summary from 300℃ to 500℃[J]. American Journal of Science, 1991, 291: 309–338. DOI:10.2475/ajs.291.4.309. Heinrich C. The physical and chemical evolution of low-salinity magmatic fluids at the porphyry to epithermal transition:a thermodynamic study[J]. Mineralium Deposita, 2005, 39(8): 864–889. DOI:10.1007/s00126-004-0461-9. 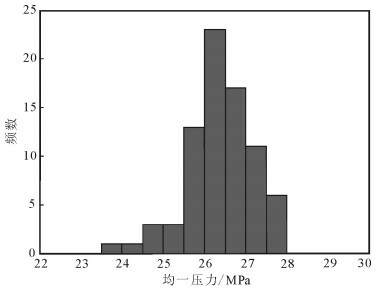 Krumbein W C G R. Origin and classification of chemical sediments in terms of pH and oxidation-reduction potentials (A careful study of the pH and oxidation potentials of the common sedimentary environments and the resultantmineralogy)[J]. The Journal of Geology, 1952, 60: 1–33. DOI:10.1086/625929. 李秉伦, 石岗. 矿物中包裹体气体成分的物理化学参数图解[J]. 地球化学, 1986, 2: 126–137. DOI:10.3321/j.issn:0379-1726.1986.02.004. 王真光. 矿物包裹体成分物理化学参数的计算程序[J]. 地质与勘探, 1991, 27(7): 22–25. 徐文炘, 陈民扬, 喻铁阶, 等. 矿物包裹体成分数据的热力学计算方法及应用[J]. 矿产与地质, 1985(1): 35–50. 胡新露, 姚书振, 何谋春, 等. 河南省上宫金矿成矿热力学条件及成矿机制[J]. 中南大学学报(自然科学版), 2013, 44(12): 4962–4971. 吴湘滨, 戴塔根, 何绍勋. 湘西南石英脉型金矿矿物流体包裹体pH值和Eh值的估算[J]. 大地构造与成矿学, 1999, 23(3): 248–253. 刘斌. 简单体系水溶液包裹体pH和Eh的计算[J]. 岩石学报, 2011, 27(5): 1533–1542. 苏根利, 李和平, 刘丛强, 等. 高温高压下水流体pH值测量[J]. 地学前缘, 2009, 16(1): 27–32. Ding K S W E. Direct of pH measurement of NaCl-bearing fluid with an in situ sensor at 400° C and 40 megapascals[J]. Science, 1994, 272: 1634–1636. C F G. Gorrection of Holloway's(1997) adaptatation of the modified Redich-kwong equation of state for calculation of the fugacities of molecular species in supercritical fluids of geological interests[J]. Contributions to Mineralogy and Petrology, 1979, 69: 315–318. DOI:10.1007/BF00372333. 阴翠珍, 礼彦君. 内蒙撰山子金矿流体包裹体特征和成矿物理化学条件探讨[J]. 太原理工大学学报, 2007, 38(6): 477–480. 徐文炘. 矿物包裹体中水溶气体成分的物理化学参数图解[J]. 矿产与地质, 1991(3): 200–206. 卢焕章, 范宏瑞, 倪培, 等. 流体包裹体[M]. 北京: 科学出版社, 2004: 181-185. Pirajno F. Hydrothermal processes and mineral systems[M]. Berlin, Germany: Springer, 2009: 535-580. 舒全安, 陈培良, 程建荣. 鄂东铁铜矿产地质[M]. 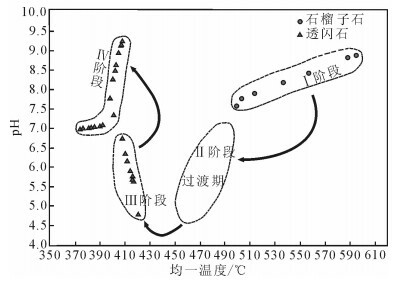 北京: 冶金工业出版社, 1992: 1-510. Xie G Q, Mao J W, Li R L, et al. Re-Os molybdenite and Ar-Ar phlogopite dating of Cu-Fe-Au-Mo (W) deposits in southeastern Hubei, China[J]. Mineralogy and Petrology, 2007, 90(3/4): 249–270. 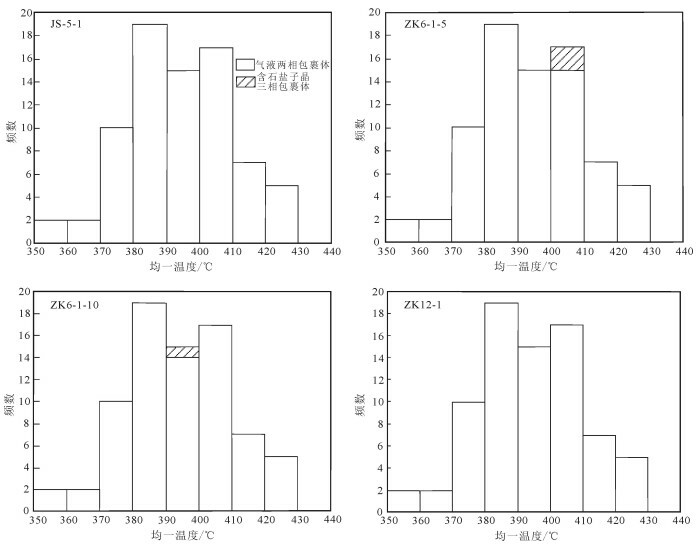 Xie G, Mao J, Zhao C. Mineralizing pulses and geodynamic setting of Cu-Fe-Au polymetallic deposits in the Lower Yangtze valley, east-central China[M]. Mineral Deposit Research: Meeting the Global Challenge, 2005: 1201-1204. 费红彩, 肖荣阁. 成矿流体演化与成矿物理化学[J]. 矿物岩石地球化学通报, 2002, 21(2): 139–144. 涂光炽. 中国层控矿床地球化学[M]. 北京: 科学出版社, 1984: 1-354. 张朋, 杨宏智, 孙景贵, 等. 黑龙江省马连金矿床流体包裹体特征及其地质意义[J]. 中国地质, 2015, 42(1): 265–274. 李延河, 谢桂青, 段超, 等. 膏盐层在矽卡岩型铁矿成矿中的作用[J]. 地质学报, 2013, 87(9): 1324–1334. 张德会. 流体的沸腾和混合在热液成矿中的意义[J]. 地球科学进展, 1997, 12(6): 49–55. 王玉荣, 樊文苓, 郁云妹. 碱交代与铁矿形成的地球化学机理探讨[J]. 地球化学, 1981(1): 95–103.